Another fledgling leaves the nest! 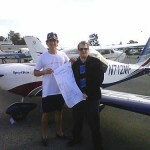 Congratulations to Guillaume De Zwirek who successfully soloed SportStar 712MF under Adam’s watchful eye. Well done Guillaume and Adam. Tags: California flying, Light Sport, LSA, pilot, Pilot license, solo, sport pilot, SportStar.